After 82 girls were freed on Saturday, the Bring Back Our Girls group has said there are still over 130 Chibok schoolgirls missing. The campaign for the release of the nearly 300 Chibok schoolgirls seized three years ago by Boko Haram says it is glad Nigeria's government is committed to freeing the 113 girls still unaccounted for. A statement by the Bring Back Our Girls group on Sunday says the campaign is still waiting for a list of the names of the 82 girls released. A special adviser to Nigeria's president says the 82 freed Chibok schoolgirls have arrived in the capital, Abuja, a day after their release. Femi Adesina tweeted the girls have been received at the airport by the president's chief of staff and are expected to meet with President Muhammadu Buhari later Sunday. This is the largest release since Boko Haram seized 276 schoolgirls from Chibok three years ago. Nigeria's government says the release came in exchange for some suspected Boko Haram members who had been detained by authorities. 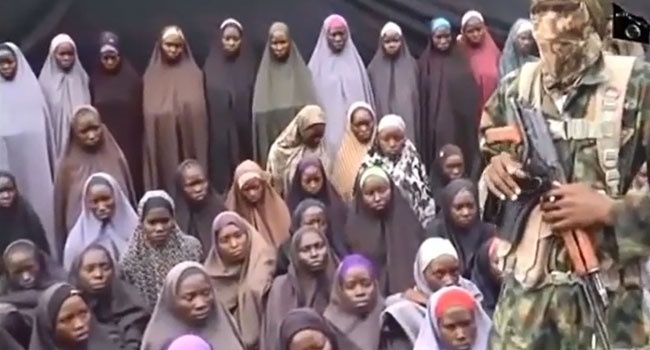 The International Committee of the Red Cross has tweeted what might be the first public image of the Chibok schoolgirls freed by Boko Haram extremists. The ICRC tweet shows a line of girls wearing shirts with the Red Cross logo walking across a runway to a waiting helicopter. "A happy sight for families missing loved ones," the aid group says. 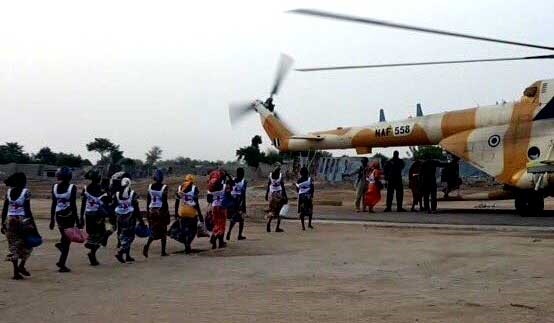 The ICRC acted as a mediator as Nigeria exchanged some detained Boko Haram suspects in return for the girls' release on Saturday.